Whether you are new to scuba diving, have always wanted to try or are looking to advance your certification, there will be a lot of questions. At The Scuba Company, it is our mission to provide thorough answers to all your questions. The Professional Association of Dive Instructors or PADI is also a wealth of information. Check out their new diver FAQ here. uoyancy Control Device (BCD), air tank, regulator or breathing device, weights, mask and fins. There may be additional gear including a wet or dry suit, hood, booties and gloves, depending on where you will be diving. What do I need to do to start diving? To start diving, it is simple. You can start by trying the Discover Scuba class, a basic introduction to the concept. This class will walk you through the basic equipment and skills you will need and follow up with an underwater swim in a pool. However, if you know that you want to be certified, the Open Water Certification is the best way to jump in. PADI’s Open Water Certification is the most recognizable by other diving organizations. We have an interest form if you want more information or stop by the shop to discuss the best route forward for you! How can I try scuba diving to see if I even like it? The Discover Scuba course will provide you with the ability to try out the equipment, basic concepts and actually breath underwater under the direct supervision of a professional diver. Discover Scuba will provide you with the opportunity to decide if you are interested in pursuing diving, rather than jumping into a full certification. If you decide you like it, you can apply to cost towards your Open Water Certification! What goes into learning how to dive? in the pool. Once you have mastered the basic skills in the pool or confined water dives, you will then move to the open water for the final portion of your certification. Typically this involves two days out at Blue Hole in Santa Rosa, NM. During these two days you will complete your training and obtain your certification! I have done scuba before and obtained a certification, how do I get a refresher? 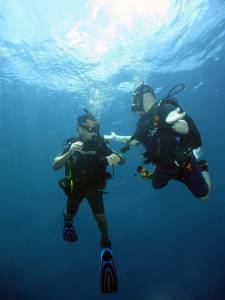 The Scuba Company provides the PADI ReActivate course. The course offers you a refresher to get reacquainted with the basic dive gear and skills previously learned. Even if you haven’t been diving in quite some time, the ReActivate class will get you ready to dive again! PADI certifications never expire, however, you are welcome to re-take any class you would like. I don’t have a buddy, can I still take a class? You don’t need a buddy to start taking classes. You will find yourself surrounded by many others, like you, interested in diving but without a buddy. Don’t let the lack of having a buddy stop you from learning how to dive! My child wants to scuba dive, how old do they have to be? Children can begin diving as early as age eight with the Bubblemaker and Seal Team programs. These programs provide children with the opportunity to learn basic diving skills while having fun. If your child is ten years of age or older, they are able to obtain the Junior Open Water Certification, which allows them to dive to 40 feet with a PADI professional. If your child is twelve or older, and has completed the Junior Open Water Certification, they are eligible for the Advanced Open Water Certification. There are several specialties that have specific age restrictions. Please review these prior to enrollment. Do I have to be a good swimmer to dive? In order to become certified, you will need to fulfill swimming requirements. Open Water Certification candidates must be able to swim 200 yards. There is no time limit and you are able to utilize any swimming stroke you prefer. Candidates must also be able to tread water for ten minutes, again using any methods you are comfortable with. Are there any physical limitations that would prevent me from starting? 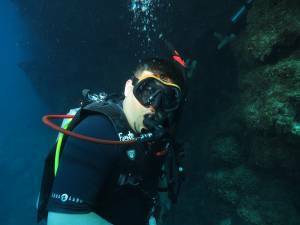 Prospective divers worry that ear problems or physical limitations will stop them from diving. All diving activity requires the completion of a medical form. Should any negative answers interfere with any diving related activity, you will need to obtain medical clearance from your doctor. Our team is certified through the Handicapped Scuba Association which provides them with the ability to accommodate a larger range of divers. These divers must also be medically cleared for diving. As far as equipment, what will I need to start? Depending on which class you decide to start with will depend on what you need. If you are just trying out diving with Discover Scuba, you don’t need anything! If you are moving into Open Water Certification, you will need personal fins, mask and snorkel. These items are rent-able, however, you will likely want to purchase your own. By picking out your own equipment, you will be much more comfortable and confident in your gear. Does The Scuba Company organize any dive trips? Though New Mexico does have a surprising number of great places to dive, most divers have a great desire to go outside the Land of Enchantment to dive. Many, if not all, of our team travel for an annual dive trip. A complete list of these trips can be found here.